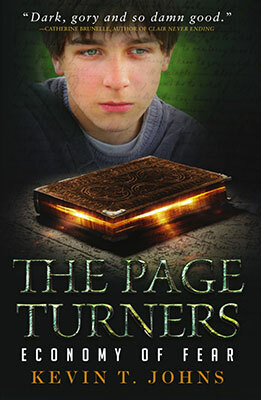 After discovering a book of magic hidden in their high school library, The Page Turners book club members—Nate, Danny, and Spenser—performed a spell that accidentally released a vampire from the pages of fiction into the real world. Reading books always brought me life. The stories filled me with something that wasn’t there before, took me to other places, and taught me new ideas. There’s nothing as exhilarating as a book exceeding your expectations by a thousand times. Don’t get me wrong, I did expect to enjoy Economy of Fear—at least as much as the first novel The Page Turners #1: Blood—and I was genuinely excited to know what was in store for the unfortunate city of Maplewright. Nonetheless, I didn’t expect to be that blown away. While Kevin T. Johns was showing great potential in his debut novel Blood, his writing skills in Economy of Fear have blossomed spectacularly. For the reader, this is pure joy. First, Economy of Fear jumps right into the action. The first chapter is a mysterious, dark, tense… and bloody reminder that The Page Turners is definitely a horror series. Then the second chapter tactfully brings you back to Maplewright, all the while maintaining a heavy, threatening atmosphere that will remain throughout the book. The story has left behind high school dramas and the somewhat lighter feel of Blood, and set the tone for a more intense and complex plot from the very first line! Also, I found Economy of Fear perfectly paced. Good bye the somewhat lengthy book quotes that Nate used to make in Blood, and hello short and action-packed chapters, ending in punch lines and cliffhangers that will literally prevent you from putting the book down. Marie Elliot’s dead parents were in the tunnel behind him. Their rotting zombie corpses drew steadily closer to him—pulled forward down the tunnel by skeletal hands dripping gelatinous flesh. Their heads hung limp on necks torn and eaten down to their vertebrae by vampire fangs, and their lipless mouths were frozen in permanent grins. In Blood, my favourite aspect of the book was the character development of Nate, Spencer, Danny and his younger sister. I’m really happy to say that it still is in Economy of Fear, except it’s even better! While Diana is unfortunately less present, the personalities of the three boys really mature while they follow different paths. The three of them face adversity in their own unique ways and develop their own vision of the world, growing into adults in the process. We’ve seen magic take place. Vampires, aliens, fictional characters made real through magic words. Doesn’t that mean there is more to life than just … this? Doesn’t it mean there must be something beyond death? If magic exists, doesn’t that mean Heaven must exist too? Actually, it’s quite a tour de force what Kevin T. Johns achieves here with these three distinct narratives. While Spencer gets abducted by aliens in a true X-files fashion, Danny remains behind and faces the continued vampire threat, while Nate slowly takes his distance with The Page Turners’ group and seems to take a turn for the worst. What we get is a mix of science-fiction, fantasy and slight horror. What could be a ludicrous, incredible mess turns to be a brilliant and riveting variety of quickly alternating point of views, bound together by a solid plot. Quite amazing. In short, The Page Turners #2: Economy of Fear is your perfect summer read. It’s a thrilling triple adventure that won’t leave you bored for a second. It’s an utterly entertaining and relaxing read. As much as I liked Blood, I loved Economy of Fear: the pace, the atmosphere, the character development and the variety of situations are just riveting. I highly recommend this book and now, unfortunately, starts the wait for the third tome.